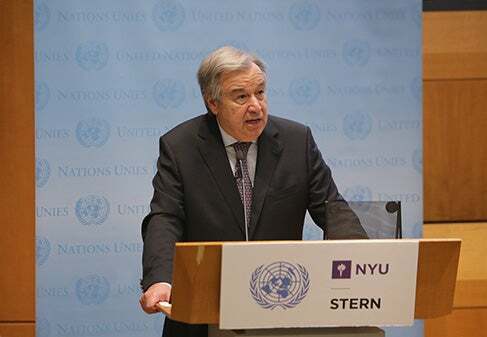 On May 30, New York University welcomed United Nations Secretary-General António Guterres to the Stern School of Business for an event entitled “Climate Action: Mobilizing the World," during which Guterres issued a global call to action to meet the international climate challenge. The Secretary-General was introduced by New York University President Andrew Hamilton, who said the topic of conversation touched on an issue of immense importance that needs to be addressed in a global and interdisciplinary way. “Climate change is an issue with which we as a university are very much engaged -- in the university, across the city of New York and across the world,” Hamilton said, noting that through a university-wide effort led by the NYU Sustainability Task Force, the university succeeded in reducing carbon emissions by 30 percent between 2006 and 2012, and has accepted New York City Mayor Bill de Blasio’s challenge to further reduce emissions by 50 percent by 2025. NYU Stern Dean Peter Henry also offered introductory remarks and reiterated that the Stern School is committed to continuing to take steps toward climate action. 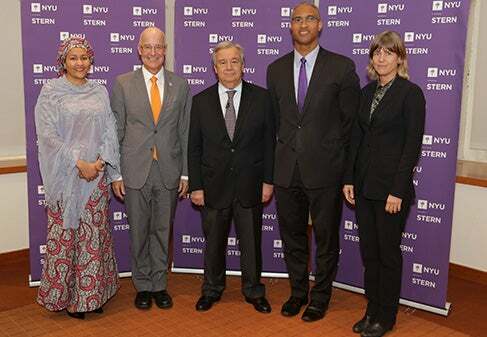 “Here at Stern we believe that business can be a force for good in the world, that in the quest to create value not only for shareholders but for all stakeholders, the impact on both business and society truly matters,” Henry said, noting the efforts by Stern’s Center for Sustainable Business and Center for Business and Human Rights, a first of its kind among business schools. Addressing students, faculty, and business leaders among others in his first public speech on climate action, UN Secretary-General António Guterres described both the increasing risks from climate change and the opportunities provided by climate action to create jobs, generate economic growth and build the foundations for a safer and more stable world. “Climate action is gathering momentum not just because it is a necessity but also because it presents an opportunity – to forge a peaceful and sustainable future on a healthy planet,” Guterres said. Following the Secretary-General’s speech, a question and answer session was moderated by Professor Tensie Whelan, director of the NYU Stern Center for Sustainable Business. She began the session by asking what role students can play in their personal and professional lives to address climate action. “Students can have an influence with their communities and engage with their communities in line with a green economy,” said Guterres, explaining that students can engage with civic organizations, use their power as consumers and get involved with politics among other actions. Read Secretary-General Guterres' remarks here.